The new feature is that the Review Details now lists records, additional photos, and the tree where this information was found! This is a vast improvement. Sometimes I can even accept the potential parent from this. Note that when you click the green Yes, the person is added to your tree with its image, if there was one. Then you get a box to go to that profile in your tree where you can look through the hints and possibly find even more information. 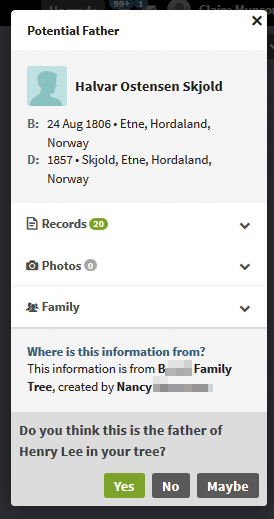 Clicking on Family opens up the information about this person, their spouse and all the children as was shown before but the new great addition is “Where is this information from?” just below Family. 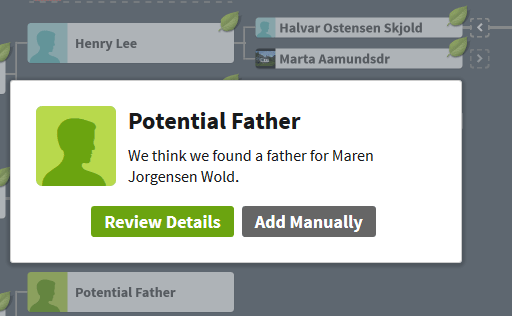 Clicking that shows you the username and tree name that Ancestry used to propose this information. Now if only clicking on the username or the tree would open it in a new tab or window. However you can get to that person and their tree by clicking on Member Directory in the drop down menu under Search. Then find the person by filling in the username in the box under “Find a Specific Member” and click the search button. Definitely the Potential Parent feature is now much more useful! This is interesting. Or better, this is curious. It includes some of the possible ancestors suggested by ThruLinks, but not all of them. I am not sure how they decide which to include. How does one contest an erroneous ancestor in Thrulines or Potential Parent. There is a bulky Chancery Case in Virginia that has information that would contest this. If I go to the time and expense of obtaining this record and include my analysis to what entity do I submit it? Carol, I would humbly suggest that you share the chancery documents (or probably a subset of the documents with the most important information, since it sounds like a large file) in your ancestor’s Ancestry gallery, and offer either the full or abridged file to others. I routinely make pdf documents out of Civil War pension and/or service files and share them in the gallery. Usually I’ll select the most genealogically significant documents, and if the pdf is still too large for Ancestry’s size restriction, I’ll run it through a pdf compressor program. I see getting such information in front of others is a good thing, and, with luck, they’ll share something that I don’t have. Carol, I agree with Larry. Add your documents to the gallery for your ancestors. You can take pictures of them (or the most significant parts) with your smartphone if that is easiest. I’d love an answer for your question too. Seems like I spend more and more time correcting Ancestry’s errors than I do researching my tree. I agree that I am using Potential Father and Mother more now than ever before. I don’t know what they did to improve their algorithm, but it sure is working. Thanks for your tips on using the feature.